Tanaejah Taylor faced the challenges of homelessness while she was finishing high school and completing Nurse Aide studies at ECC. One of Edgecombe Community College’s most disciplined students is a great illustration of how education, grit, and perseverance can change a life. When Tanaejah Taylor graduated from Tarboro High School in 2016, her hard work had already paid off. She not only received her high school diploma, but also two certificates she earned through the Career and College Promise program with Edgecombe Community College. Career and College Promise enables students to take college-level classes free of charge while they are in high school. Taylor earned Certified Nurse Aide I and II certificates while she was finishing high school. What sets Taylor apart is her resilience. While she was in her junior and senior years of high school and attending ECC, she and her family were homeless. Taylor says teachers treated her with kindness and empathy. She learned to take one day – and one obstacle – at a time, enabling her to succeed in high school and at ECC. Toria Moore, a Health Occupations instructor at ECC, remembers Taylor in the Nurse Aide class. “She took four classes from me during her senior year of high school. She stood out right away because she seemed very mature for her age,” Moore says. Moore later learned more details about Taylor’s home life and was moved by her tenacity and drive to succeed. “With everything going on in her life, Tanaejah could have easily given up, but she didn’t. She remained focused. I greatly admire her drive, strength, and determination to succeed,” Moore adds. Currently, Taylor is in her second year of studies at ECC and is completing requisites to enter the Nursing program. Her goal is to become a registered nurse and to obtain a bachelor’s degree. 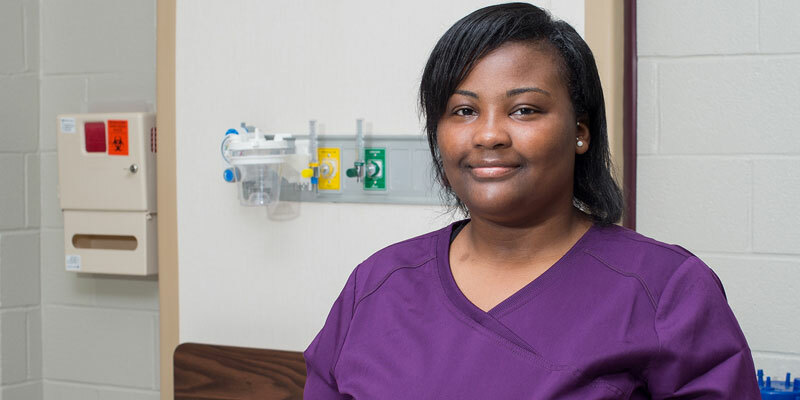 She works full time at Vidant Medical Center in Greenville in the surgical intensive care unit as a CNA II. “I knew I wanted to be a nurse, but I didn’t know how I was going to be able to go to college,” Taylor says. “I received an EDGE Scholarship and other financial aid that has really made a difference in being able to continue my education. ECC has helped me find resources to help pay for school so I can achieve my goal to be an RN. “Never give up,” she adds. “I’m proof that if you work hard and make school a priority and stick to it, your dreams can come true.